The arrival of these “hemlock vampires” in Nova Scotia is not good news. Hemlock Woolly Adelgid. “Their name comes from waxy white filaments they make to protect themselves from drying out. In a heavy infestation, hemlock trees can look gray from all the “wool” on twigs and branches. They can’t fly, but are spread by wind and also hitch rides on the feet of birds, which can carry hemlock wooly adelgids for long distances. These “hemlock vampires” were first discovered in 1951 in Virginia, and by 2005 had spread to fifteen other states. Frontline Forestry Research Applications Technical Note No. 114 (Natural Resources Canada). A map shows the Native range of eastern hemlock in North America and occurrence of Hemlock Woolly Adelgid. To understand the potential impacts of HWA on hemlock, it is important to visualize a healthy hemlock-dominated ecosystem. Eastern hemlock is a medium-sized, long-lived shade-tolerant tree that prefers cool, moist sites. The dense crowns of this species cast a deep shade that excludes most other tree species in the canopy and understory, and it is considered a foundational tree species, particularly in riparian habitats, where it creates a unique ecosystem structure (Fig. 6). Hemlock-dominated ecosystems have low rates of soil decomposition and nutrient cycling, resulting in the rapid accumulation of a duff layer. Such conditions also stabilize flow rates and minimize water temperature variation of streams that support a small but dependent group of aquatic and terrestrial animals. In mixed stands, hemlock is found in association with yellow birch, sugar maple, American beech, eastern white pine and red and white spruces. The thermal properties of hemlock crowns and canopies are such that these stands provide critical microhabitats for several bird and mammal species throughout the year. Invasion of hemlock stands by HWA may cause a cascade of changes that ultimately affect the structure and function of this distinctive ecosystem in Canada. Description by entomologist By Kathleen Ryan of Silv-Econ Ltd. on Invasive Insects in Canadian Forests, a website created with support of Natural Sciences and Engineering Research Council of Canada. It was found in isolated locations in Etobicoke, ON in 2012 and in Niagara Gorge, ON in 2013, with subsequent finds in 2014 and 2015. All infested trees were removed and the adelgid is not yet known to be established in eastern Canada. However, because it is difficult to detect, HWA could be here already, or could arrive soon from nearby infested forests in the US. HWA threatens hemlock trees, genus Tsuga. It feeds on the tree’s food storage cells. The hemlock “walls off” the area where the HWA is feeding, causing a disruption in nutrient flow and, eventually, killing the needle. Needles will dry out, gray, and fall off. Over several years, whole limbs will die back, killing the host tree from the bottom up. Stressed hemlocks are more likely to become infected with mortality typically occurring within 4 to 10 years after infestation by hemlock woolly adelgid. The good news is that, in contrast to the situation with the emerald ash borer, there is some hope for actually controlling HWA. For one thing, chemical treatment is both effective and economical. Insecticides are used to eradicate early infestations in the wild, and also to preserve hemlocks in home landscapes and public areas. These chemicals can be applied to the soil around a tree, but are usually sprayed on or injected into the trunk. With any invasive pest, early detection is important. But in the case of HWA, scouting and early detection can be, and has been, critical in preserving hemlocks in sensitive habitats. Learning how to identify HWA can make a real difference in your woodlot or your favorite camping spot. We all need to stay tuned on this one. Thanks to DC for directing me to the News Release. I share your sorrow. The profoundness of this news takes a while to sink in. 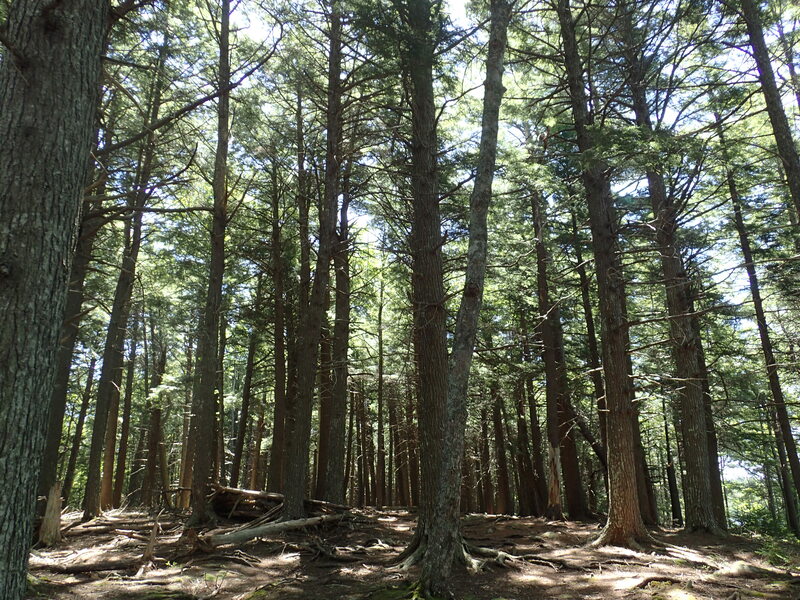 Much of the Acadian forest was defined by Loucks as the “red spruce-hemlock-white pine zone”. And now this defining species… a foundational species of late-successional forest will meet inevitable collapse. I am heartbroken. Nature’s cathedrals are collapsing-these natural places where some of us go to worship, to breath deeply. Donna wrote about some of what we stand to lose in Hemlocks: nature’s pharmacy (CH 2013). I think the prognosis is uncertain, David. I’ve been watching what has happened in Pennsylvania over the last 15 years or so, and most of the hemlocks are surviving, both on the certified state lands (I know one of the auditors) and on a tree farm owned by my partner’s family (who monitor the health of their woods very carefully). This is surely a bad thing, but perhaps not as bad as it could be. According to all sources I’ve both consulted and read, we can expect very high mortality. The ‘wild card’ is how long it will take under a NS climate. Right now, most of it is in the ‘banana belt’ of the province… Compare those stands with hemlock in Cape Breton. Perhaps Cape Breton will do much better (I hope so). The other factor is apparently very low genetic diversity in hemlock. Global warming and global trade and travel: All factors impacting our most defining species of the Acadian forest. This entry was posted in Acadian Forest, Pests. Bookmark the permalink.